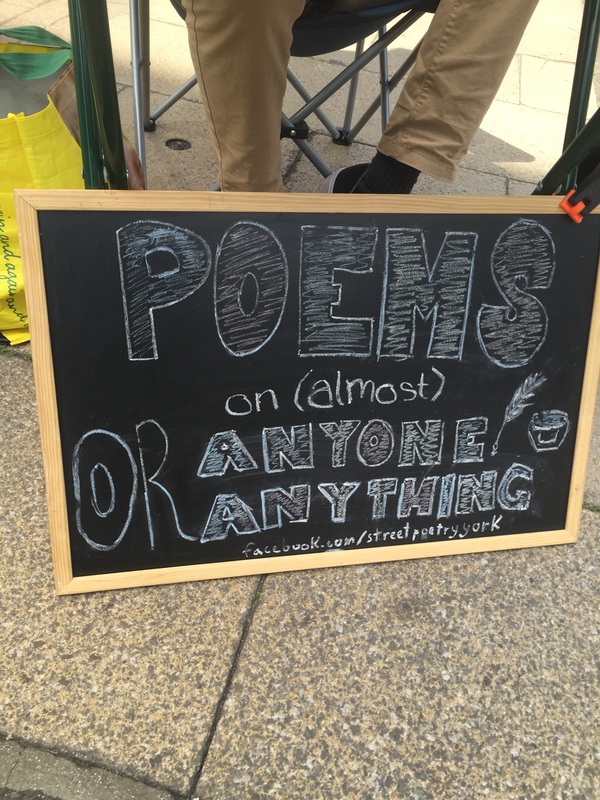 Wandering through town the other day I was surprised and delighted to see a man sitting behind an old fashioned typewriter and a sign declaring, ‘POEMS on (almost) anyone or anything’. Of course I couldn’t resist going and talking to him! So there we go. This is for all my students who’ve ever asked, ‘but what’s the point of poetry?’ I hope you like it as much as I do! Do go and find him – he was on Parliament Street last week though I don’t know if he’s always there. And buy a poem! He’s on Facebook at this link, or you can search streetpoetryyork (with no spaces, just like that) to find him. This entry was posted in English, Poetry, PREP and tagged English tutor York, North Yorkshire, online english tuition, online english tutor, poetry, stefan kielbasiewicz, york poet. Bookmark the permalink. Literary Events 2015-2016 – PREP in York trips and visits!